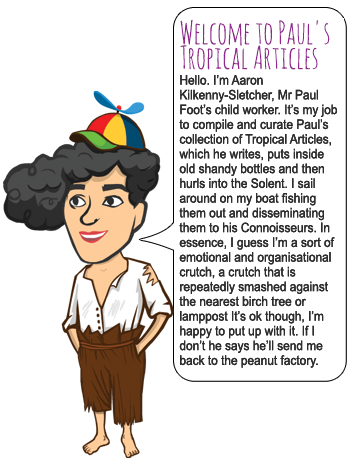 Every time Paul writes a Tropical Article to inform his Connoisseurs of the Tropical issues of the day, his embattled and beleaguered worker, Master Kilkenny-Sletcher, obsessively collects them in old Vimto bottles and hoards them in a nook aboard his tragic barge. He is often seen adrift off the shore of Gosport curating his ridiculous library and battling seagulls with a harpoon. As we approach the Queen’s 90th birthday in a few weeks, let us spare a thought for another royal, largely forgotten these days, who also has a big birthday coming up: Prince William, who will be 50 later this year. In honour of this milestone, here are some facts about Him at a glance. 1. Staid, dull, out of touch, privileged and irrelevant, William is nevertheless worthy of our deep respect and reverence, of course. 2. Massively unpopular with the public, plus bald; many hope that, after the Queen is gone, the Crown will pass directly to William’s popular, charismatic son, Georgie, 0. 3. Will’s wifey, Our Kate, was once tipped to be one of the world’s most beautiful women; but nowadays looks a real fright in her awful, frumpy Duchess outfits. Attention is turning to why William did not marry Katie’s sister, Pepper Middleton. 4. Willy’s half-brother, Harry, was once photographed wearing only his bare bottom during a Las Vegas sax session. 5. The least popular royal (with the exception of Princesses Anne, Edward and Andrew) remains Camilla, Duchess of Benson and Hedges; who, nevertheless, would be great fun at a dinner party. It has been revealed that 97% of migrants attempting to get into the EU are desperate asylum seekers fleeing war and persecution / economic migrants chancing their arm at a better life at our expense. This is why it’s so important that we remain in the EU so we can work together to solve this humanitarian crisis / leave the EU so we can reestablish control of our own borders. In other news, financial experts have stated that a Brexit would harm our trade with Europe and diminish our standing in the world / allow us to agree better trading arrangements with Europe and make us a stronger world power. Also, if we left, we’d still have to abide by the rules of the EU, but without having a say / could make our own rules, which would be a lot better. A vote to leave would be totally irresponsible and a dangerous leap into the unknown / a jump from a sinking ship and the best thing we’ve ever done. At the end of the day, no one’s saying Europe is perfect – it needs reform- but we’re stronger together / Europe is undemocratic and unaccountable and we’re better off out of it. The vote looms. I’ve given you all the information. Now you decide. A man called Donald Trump has been in the news a lot lately. He’s well heeled and well trending! All of a sudden everyone has an opinion on Donald T. Rump, even my friend Dot who works down at the dogs. Where did these opinions come from? Donald Frump’s carefully designed attention wheel? C’EST PAS VRAI MAUREEN! But ye see – as much as we hate Donald Chump because of what we’ve seen on the internet – Donnie don’t care baybayyyy! Actually, he does care… about getting as much publicity as possible in the run up to a major election campaign. Does he really hate immigrants when all of his wives, ex-wives, chefs, pool assistants and in-house tortoise-themed ceramicists (Rep-Tiles.Com is one of T. Rump’s lesser known cash cows) are ALL immigrants? Of course he doesn’t! Stupid people hate immigrants, and who does Donald Mumps need the support of in winning an American election? I’ve no idea because I’ve lost interest, but here are 5 Things That I Love About Donald Trump. Let’s not beat around around the bush. Actually let’s! Donald Trump is a top business chap, plastic surgery pioneer and reality TV legend. That’s actually three reasons to love Donald Trump. But let’s focus on what really matters: Reality TV baybayyyyy!! Donald Trump, as we all know, starred in the popular television show The Apprentice. What’s more – he quit while he was ahead. Meanwhile, here in England, Alan Sugar is still looking into Qur’an Brady’s chest for answers that are never going to come. Donald Trump is clever, and that’s why he has more chance of becoming the President than Alan Sugar does of becoming the Crime Minister. Imagine that. What a shocker! **Remember – Donald Trump went to Pencil-vania University because he really, really wanted to. There was never a question of him being not quite smart enough for Harvard, Yale or Princeton…. His hair! Speaking as someone with a distinctive hairstyle, and – let’s not beat around the bush, literally this time – (I am the inventor of the long back and sides – I’ve even patented it – Slade are actually just my pension plan) I can identify as a fellow hair icon with how much hard work is involved. Never mind employing someone to manage my hair, I have to employ someone just to manage the comment boards about it – in Amersham church yard, let alone the rest of the world. It’s all too easy to make jokes about Trump’s hair, but as we know from world-famous brunettes of the past such as Marilyn Monroe – blondes have more fun! In other words, blondes are always up for a sax session. Look no further than popular culture blondes Pat Butcher, Myra Hindley and that one off ITV. HE’S HAVING A WHALE OF A TIME! While all of us complain about how much we dislike Donald Trump… it almost seems like he doesn’t care! Could it be that he’s one of the Top 10 wealthiest people in the world? While you craft those poisonous tweets, he could, in theory, respond by just buying Twitter tomorrow and shutting it down JUST FOR THE LOLZ. “What about Twitter’s board of trustees?” you cry. OH MY GADD! THEY’VE ALL BEEN POISONED IN THEIR SLEEP – WHAT ARE THE CHANCES!? Donald’s one of the only famous Donalds in the world. He’s a personal branding genius! Or has he had all other Donalds assassinated the second they start to show promise? He’s the King Herod of Manhattan! Herod – another top notch name. Donald Trump is anti-war, something we all admire in him. He’s so anti war that he managed to dodge being drafted into the Vietnam War numerous times, although admittedly this was because he has a serious condition called ‘Spurred Heel’ in one of his feet. When interviewed recently and asked which foot it was in.. he couldn’t remember… BUT THAT DOESN’T MATTER! Our Donnie’s a busy man. The Internet is to be disbanded at the end of this month. The surprise UN (new year’s) resolution was passed after it was realised that the Web was taking up too much of everyone’s time and trouble. 12th Decadence: Facebook closed down,. This will force people to actually see their friends in person. As for “online contacts”, it has been decided that if you have never met someone then you don’t know them. So just forget about them. 14th: Skype shut off. Let’s face it, it never really worked properly anyway. So this will go pretty much unnoticed. 17th: The last ever email will be sent at 2:07am (a message urging someone to buy viagra). After this, there will be no more spam; and, instead of being cc’ed into 76 emails you don’t need to read, you will able to just get on with your job! It will also free up the @ symbol to go back to its old job of appearing on accountants’ ledgers. 21st: All web forums ended. Online trolls will have to pluck up the courage to make idle threats against women in real life, or else get a life themselves. 28th: Television on the iPlayer scrapped. You will have to watch whatever is currently on the telly, or just not bother. 31st Decadence at 1:09pm. No more wifi or 3G connection problems ever again! The Internet is turned off for good. Why not read a good book, or go for a walk? In the meantime, remember to print off all your emails and web pages you’ve visited and send them to the newly-built Museum of the Internet, 46 Turncoat Lane, Essex, so that your children and grandchildren can see what you spent all your time on. Top businesslady, Carolyn Fairbairn, Chairmum of the CBI (Confusion of Business Idiots), has said business dinners are not female friendly, as “women” prefer to go home and spend time with their children and unemployed husband than spend the evening eating sushi and earning billions. In an interview with whoever, Ms. Fearbun stated that business dinners are “not very inclusive” for women (because presumably women do not eat food after sundown?) and that “maybe the business dinner is a vestige of old business life”. If you want to be a successful business person, you might sometimes, regardless of whether you have children or not, whether or not the snooker is on tv, or indeed whether you are male, female, or unsure, occasionally consider it necessary to attend an important business function. It’s not complicated. 1. Jam making* whilst negotiating a 25 million dollar oil contract. Terms and conditions in fondant icing with piping bag. 3. Flower arranging on the floor of the London Stock Exchange. Sterling’s weakened, the Commodities Market is showing significant medium-term instability***. So we gorra sell that yen. And for Christ’s sake, Sandra, get that marigold out of there. It’s the wrong colour mix!! *Made using the finest North Sea strawberries. **Contains eggs – legally binding. ***Failure to achieve fiscal fluidity would result in having to go, cap-in-hand, to the IVF. In Britain, the first gay marriage was between David Cameron and Nice Clegg in the rose garden of Downing Street, after the British public voted for a well hung parliament. Guests at the gay wedding included Black Rod and the Chief Whip. Their relationship soon turned sour after bridesmaid, Mince Cable, hit the wine at the reception and drunkenly raised VAT rates. Meanwhile, Jeremy Corbyn, leader of the Labia Party, has been accused of homophobia after he refused to kneel before a Queen and kiss her ring, and mistook the Privy Council for a Westminster cottaging organisation (which is probably is!). However, when it was explained that it is simply vital, ceremonial flummery to submit to an unelected, multi-millionaire aristocrat in order to join a secretive, privileged security council which strengthens the power and influence of MI5, MI6 and other state-sponsored spying on the peripheries of legality and accountability, he immediately said, “Ooh that’s fine then”. Saudi Arabia, Yemen, Uganda, Iran, Zimbabwe, North Korea, Australia. Lizzie is being touted by many as a top visionary of the Labour Party. She’s a moderniser with sensible policies to bring Labour back into contention. Unfortunately, all those polices are Tory policies. Yvonne is married to Ed Balls, which means she has had at least one sax session with Ed Balls, so her judgement is not to be trusted. She has no known policies and is probably a bit angry, although I can’t prove that last bit. The other day I bumped into the plastic-faced Andy and had a surprisingly interesting conversation about his radical vision for Britain and his unexpectedly deeply-held political viewpoints. “This man has so much more to him than the empty cipher we know from the television,” I thought, as our fascinating intellectual exchange drew to a close. As I stepped away, I noticed I hadn’t been speaking to him at all, but to his waxwork in Madame Tussaud’s. Jeremy Corbyn’s initials are JC. Coincidence? Almost certainly. But the baby Jesus and our Jeremy have more than just that in common. Both are challengers to their establishment (New Labour & Old Judaism respectively), both have a beard, both have built something from wood in the past (probably), both take public transport (night bus & donkey respectively), both will be crucified for standing up for what they believe in, and neither are the son of God. In the news this week there has been much discussion about expanding Heathrow Airport. While one has much sympathy for nearby villagers whose cottages may end up being next to, or under, a runway; it is difficult to feel sorry for people who bought houses right under the flight path and then moan incessantly about the noise from a runway that has been there since 1929. Or, to put it another way, if you can’t cope with aircraft noise, don’t move next door to an international airport! In this week’s letter to ye, I focus on things people moan about but shouldn’t. 1. The weather, especially in the context of “ruining our special day.” Yes, it might have rained during your wedding, but that’s the price you pay for being alive on the only known planet in the universe that supports life! 2. Inanimate objects obeying the laws of physics. People get all annoyed and start shouting when some shoddily propped up books fall down, yet they are only fulfilling their destiny of yielding to gravity. Bad luck, mate. 3. Aeroplane food. My final gripe about gripes concerns the biggest moan of them all: you’ve paid (disregarding taxes) £12.75 to an airline to move you at 600 miles per hour in great safety whilst watching a selection of newly-released films to a new destination. The whole thing wouldn’t even have been possible at any time in human history before about a hundred years ago and certainly has never been quieter or more comfortable, but moan, moan, moan: “I don’t like the chicken, this beef is inedible, call this a mushroom sauce?, this raspberry tartlet is a bit dry, etc, etc.” Pathetic. With Greece teetering on the verge of economic collapse this week, I look at the three potential outcomes and how they will affect those closest to it: journalists. 1. Greece agrees reform deal with its creditors at last minute, avoids default and remains within the Euro. This is by far the least exciting option as far as the papers and television news are concerned. Any articles about the deal that will affect millions are likely to be consigned to page 15 or further back; TV news might, if they can be bothered, create a small graphic illustrating the financial situation and run the story just after some footage of Nicole Kidman wearing a dress. 2. Greece defaults on IMF and ECB repayments, causing ruin on Greek banks and potential exit from the Euro. This is a good result for the media. Lots of footage of people queueing outside banks, a bit of wailing perhaps; followed by the big one: the Grexit, a truly ghastly word that will appear on page 1 of all the newspapers. Brief discussion about the terrible hardship that will be visited upon the Greek people, before the focus is turned back to how it will affect the rich countries and also Angelina Jolie in a blue dress that REALLY doesn’t suit her exclusive shocker, etc., etc. 3. No agreement reached between Greece and its creditors, but both sides paper over the cracks and Greece remains in the Euro for the time being. This allows the media to continue with business as usual: news articles that only vaguely explain what’s going on because none of them really understands it; plus the continuation of a whole host of pithy headlines that trivialise a complex and terrible situation, such as “Deal Or No Deal”, “Acropolis Now” and “All Rhodes Lead To Disaster”. Now that barbecue season is upon us we can relax. No need to plan anything on a Saturday or Sunday now until at least September, safe in the knowledge that we will be invited (obliged) to attend A FRIGGING BARBECUE. You put some meat on a hot grill and it cooks. That is that. No real skill required. No secrets. It’s just very basic logic. You are not exerting masculinity or impressing anyone with your insider tips on how to grill a flipping burger. AND we all know that you got off with your wife’s best friend while you were engaged – no perfectly cooked succulent five-minutes-a-side mint-infused rack of lamb is ever going to change that.